With more and more information floating around the interwebs, it has become a quite challenging task to keep your head cool. Content creators are often limited by the software or formats theyâ€™re using, effectively locking them into a silo ecosystem (looking at you Google Docs and Evernote!). With this in mind, John Gruber created the famous Markdown format in 2004. Today, it empowers writers and bloggers with the ability to write in HTML, without the use of overcomplicated and visually exhausting code. As Markdown combines the best things from two worlds, itâ€™s also greatly accessible in WordPress, allowing you to have more power over your content than with the WYSIWYG (What You See Is What You Get) editor. WP Markdown provides a few extra features apart the usual Markdown ones. You are able to activate or deactivate it in Settings > Writing, depending if you want to use Markdown for posts, pages, custom post types or comments. However, WP Markdown might be a bit intimidating if you are not used to Markdown, as it will disable the visual editor altogether, on post types itâ€™s activated. You will need to be aware that all of the future posts will need to be written using the Markdown syntax, so if you are not ready for the switch yet, try using some of the other plugins covered here. Disclaimer: When activated, WP Markdown will convert all old posts or pages it has been assigned to, to the Markdown format. 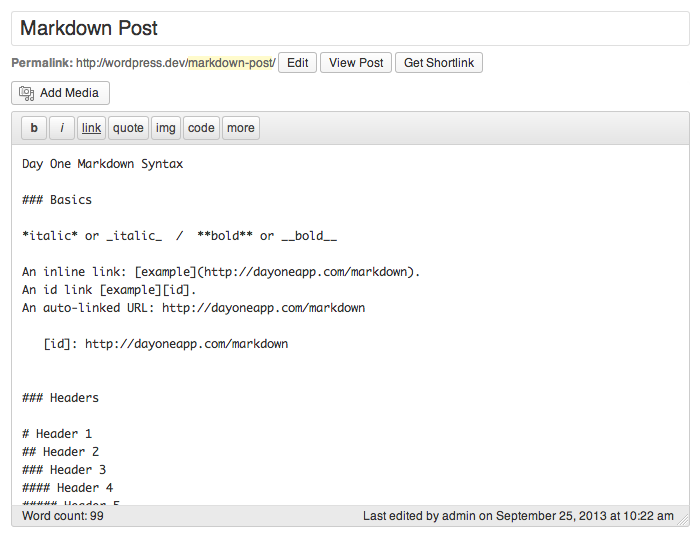 You can specifically select if pages, posts and/or comments should have markdown enabled. One of the extra features WP Markdown can call its own, is the help bar for the post editor and/or comments. Once activated, you will notice a new toolbar at the top of your post editor. You are able to insert links, images, block quotes and various other formatting elements by making use of the help bar. The formatting you selected will be inserted into your post as proper Markdown. Probably the best part of the help bar is that you are able to also add a preview box at the bottom of the post editor, allowing you to see your text when itâ€™s output. Pretty neat when you want to avoid constantly checking whether your formatting is correct. Markdown is a fairly prominent feature of Jetpack. For those unaware, Jetpack is an entire toolset for WordPress users, with features that support social media publishing, carousels, advanced comments, infinite scroll, and a whole lot more. The plugin works by allowing you to activate or deactivate different ‘modules’, which each represent a different piece of functionality. One of those modules is also Markdown. Markdown support in Jetpack is probably the flagship one for WordPress, so if you are unsure on what plugin you want to try first, Jetpack is a very solid start. Jacco Blankenspoor has written about Jetpack previously; have a look if you want to see what else it offers. Unlike most other options, typewriter completely removes the ‘Visual Editor’ feature in WordPress and replaces it with a straightforward Markdown editor. More technically, Typewriter removes the TinyMCE editor and defaults to a Markdown specific â€œTextâ€� editor and parses the output using MarkdownExtra. Typewriter is a good deal if you work a lot with code and donâ€™t mind handling pure markdown. However if you are dependent on having a live preview or switching to WYSIWYG from time to time, you might be better off with another alternative. Deserving a special place, PrettyPress reinvents the usage of the post editor as it is, making it not only a Markdown plugin. After installing it, a new button in the sidebar of the post editor â€œLaunch PrettyPressâ€� will appear. Pressing that button will launch a new editor window entirely, splitting the screen in half. On the left side, the usual WYSIWYG post editor is placed, while on the right side, you can see a live preview of the actual post within the activated theme. So you can basically have a visual editor for drafting posts side by side. 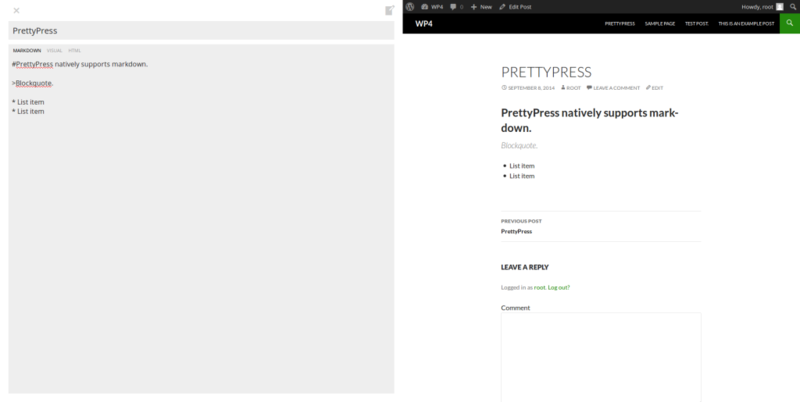 PrettyPress, does not support Markdown in the comments. It is limited to the post editor, most likely not a deal breaker. Usually, everyone has an opinion on the internet; but oddly, the voices supporting Markdown are united and I personally havenâ€™t seen any content creator despising Markdown. In fact, this very article you are reading is written in Markdown. If you want to go even further and enhance your Markdown experience with a separate editor (yay for portability), you can check out other offline editor tools to continue writing outside WordPress. Zack Wallace has some good suggestions for that. So what do you think? Are Markdown plugins for WordPress something which has made your life easier, or do you prefer writing in a separate editor? Let us know in the comments!